Filing of an application with the proper probate court. 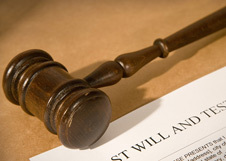 Application to appoint Executor (in the case of a Will) or Administrator for the estate. Sale of estate assets, if necessary. If my loved one dies owning everything in trust, do I still need to file an estate with the Probate Court? Why does't probate administer all property of the deceased?